As first reported in our 2010 Moonstone Saint announcement, we have been waiting a long time for the latest version of The Saint in comic book form. The wait is almost over! The first issue of the upcoming graphic novel, The Saint, will be published by Moonstone books in July 2012. The story is written by Leslie Charteris and Mel Odom, with original illustrated artwork by Eduardo Barreto. The comic format will be 16 color pages, and will be priced at $1.99 There will be two different covers, with 80% being the standard, and the other 20% a unique purple cover with a smoke trail of the Saint's stickman logo. 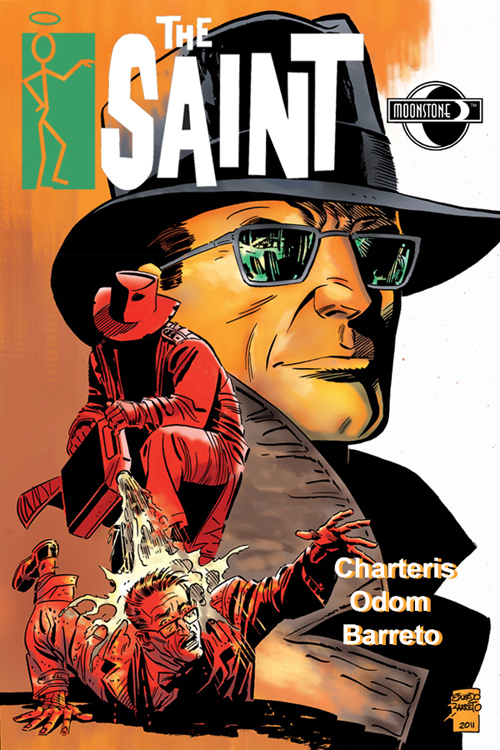 The first new SAINT comic book in America in over 60 years! Soon to be a major television show! The Robin Hood of modern crime returns! He robs from the evil and heartless rich, and gives to the wronged and deserving poor–in the process, keeping a percentage for his own expenses. He doesn’t work for the law, the government, or anyone else. He is a lone wolf…an adventurer, a detective, a rogue, but always…a gentleman! In “The Sizzling Saboteur” – The Saint travels to Texas in pursuit of a man who has been sabotaging weapons factories, but when his quarry turns up burned to crisp, he has to contend with both the local police, a trio of mysterious men behind the sabotage, and a beautiful Russian. 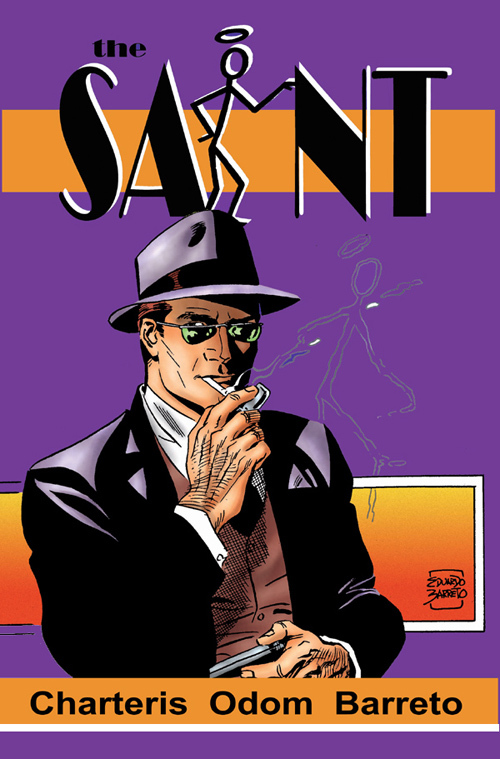 The adventures of Simon templar have been documented in The Saint books by Leslie Charteris,The Saint movies and films, old-time radio shows, comic strips, and The Saint and The Return of The Saint television series. I have pre-ordered it with my comicsdealer and took out a subscription. If all saintfans would do the same we stand a chance that it will be around for some time. I find very interesting. I seen comic shorts of the Saint in The Saint DVD extras. I wouldn't mind this copy but I should contact my local comic shop retailer. It seems that the release has been slightly postphoned? The Saint #0 has been released on the 12th of September, no further news is currently available on the next issue so far? Happy 83rd Birthday to Sir Roger Moore Today!